Cozy 2 bed rm condo with a fantastic from the top. Steps to Hospital, Lake, plaza and the bus stop is in front of building. Eat in kitchen with ample cabinets, Living room and dinette area is an open concept combination with hard wood flooring. 2 Spacious bedrms and a 4pc bath rm. In house laundry facilities and each unit has its own storage unit. Condo fee is $425 per month and includes your heating, hot water, city water and sewer and common element maintenance, parking. Call before its is gone. 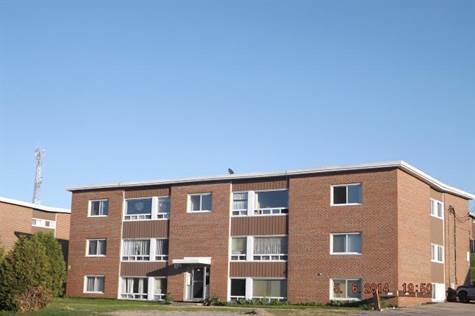 This is the last 2 bed room condo available in this complex.